Show you are part of the nanocorp and small business revolutionary community at Sohodojo and get a unique boost for your Entrepreneurial Spirit. Get an Idea Incubator today. "Jim... Timlynn," you say, "How can you take a high quality hat, enhance it with the latest Thought Retention Technology, and still sell it for the price of, well, a hat?" Friends, the answer is simple. We figure you have lots of hats at home. But how many genuine Idea Incubators do you have around the house? We're eating the extraordinary R&D expense in the development of Thought Retention Technology to position ourselves in an explosive new marketplace where we can be first and dominant. 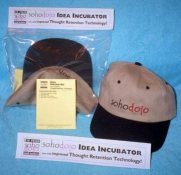 Each Sohodojo Idea Incubator comes with an unlimited supply of TRT storage devices. The first TRT storage device is packed with your Idea Incubator. Additional devices are available on-line. In addition, Idea Incubator owners enjoy a lifetime of free upgrades of their Incubator's cardware subsystem to keep up with further advances in Thought Retention Technology. All Idea Incubator ownership perks are delivered electronically here. Ha! You see! You can't follow that link until you join the Revolution! 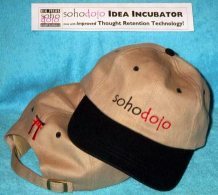 Don your Sohodojo Idea Incubator and dare to think BIG Ideas about your small business!... about Life... about the Universe. No bounds, no limits when you are wearing a genuine Sohodojo Idea Incubator! As if all this were not enough! To assure your incubator arrives with the maximum of fresh ideas, each Sohodojo Idea Incubator is hermetically sealed at the dojo factory. 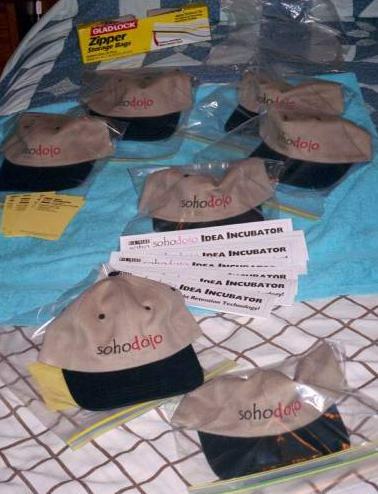 "I want to be the first on my block with a genuine Sohodojo Idea Incubator. Take me to the order form, please."